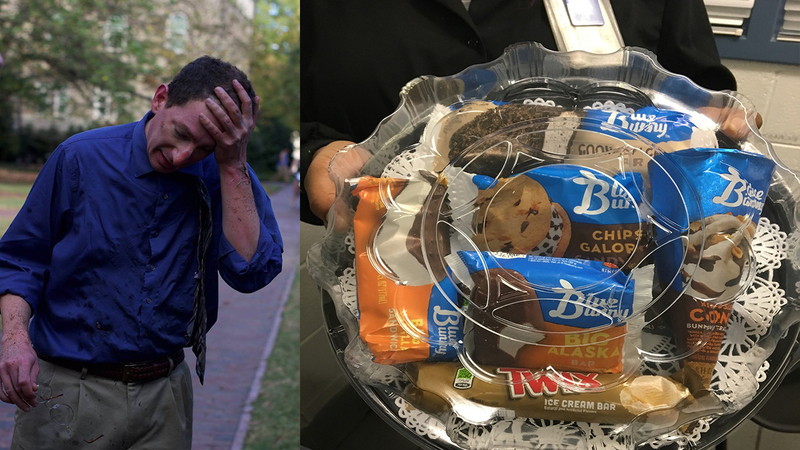 CHAPEL HILL, North Carolina (WTVD) -- A professor injured in the explosion on the campus of The University of North Carolina at Chapel Hill got a sweet surprise while recovering in the hospital. UNC Professor Dan Reichart told officials he had been on his way to get an ice cream bar when he came upon the fire at the Davie Poplar tree, also known as the Tree of Knowledge, Thursday afternoon. Of course, he wasn't able to get one. On Saturday, the nutrition team at the UNC Medical Center delivered a "bouquet of ice cream bars" to Dr. Reichart, hoping to bring a little cheer to his day. The ice cream bars were delivered with the message, "You earned this. Compliments of UNC Health Care."